Plastic carrot filled with bubble, the perfect Easter Basket Stuffer. 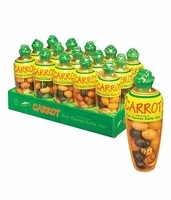 Each Carrot has a removable top and is filled with assorted fruit flavored bubble gum eggs. Not only are these a perfect Easter basket filler, but would also make a good addition to your Easter egg hunt. These year instead of just hiding some Easter Eggs around your house mix in a couple bubble gum filled carrots. Your youngsters will be delighted.